There are all sorts of situations where a company needs to accept regular payments from their customers. Utility payments, cellphone bills and store credit cards are just a few of the situations where customers make regular payments. And if one thinks that the ability for those organizations to accept payments via their website, mobile or by mail has eliminated the need for other payment options, they’d be mistaken. Some example payments include Alimony, Rent payments, Healthcare co-pays, mobile phone payments, cable TV bills, money transfers, tuition payments, and correctional facility services. Others include cell phone top-ups, long distance, and digital phone cards for International calls. There are international payment options available as well, especially for Latin Amerian countries like Mexico, where for example the customer can pay his mother’s Telmex bill in California. And how these payments are made are important to note. As much as Check21 did to simply checks, that is still a major form of payment depending on the venue. You have cash payment terminals running $5000 a day in some locations. And then there is a credit card and mobile. According to a recent survey conducted by the Federal Deposit Insurance Corporation, more than 8.4 million households in the United States are unbanked, meaning they don’t have access to a checking or savings account. Other data points to at least 50 million unbanked. Another 24.2 million households are underbanked, with access to a checking or savings account but also making use of financial products and services outside of the banking system. 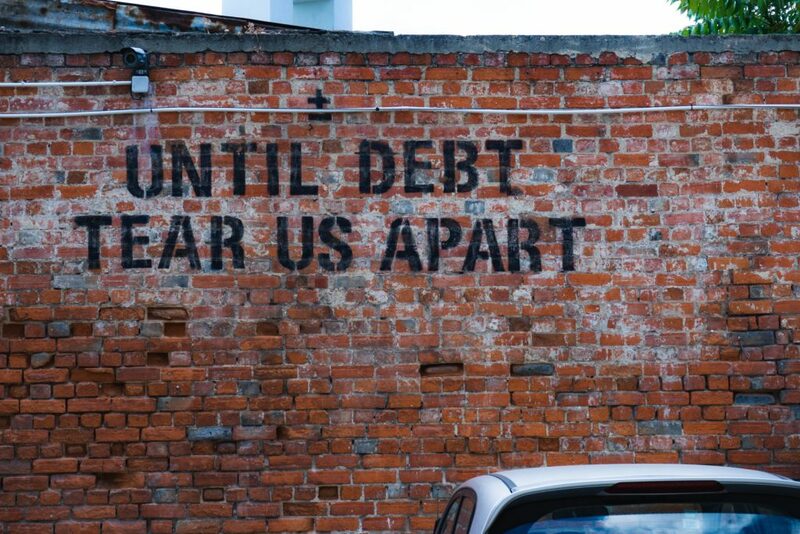 Together, more than a fourth of U.S. households are unbanked or underbanked. There are specific geographic and demographic data outlining these groups. Ethnic and cultural factors play into it with some cultures preferring cash. Having a reduced set of payment options for what can be a very large customer set doesn’t help retain and create more customers. The end result of adding bill payment options ultimately increases the cash flow for companies and expands their consumer base. Philadelphia just became the first large city in the nation to ban cashless businesses in the city, in part to protect people like construction workers who don’t have a bank or credit card. 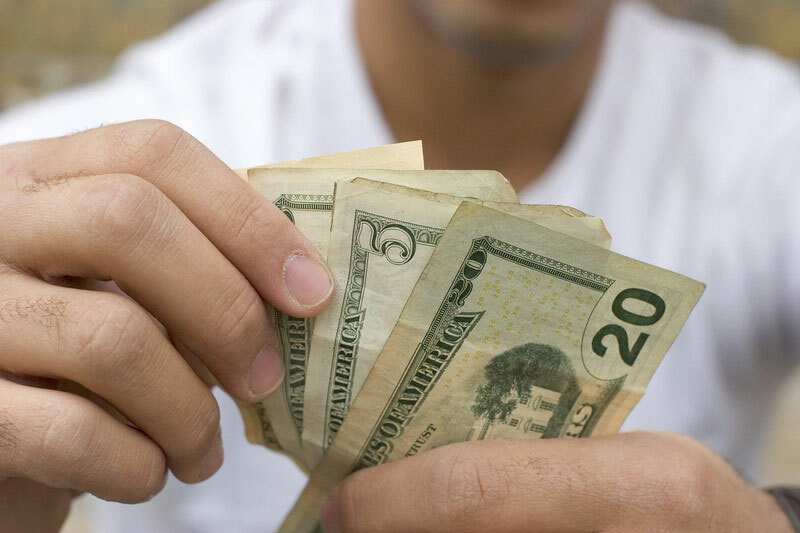 In addition, a significant portion of the population, primarily lower-income and younger people, still prefers to conduct their business in cash. Maybe they don’t trust the banking system. Maybe they tend to pay bills closer to their due date and don’t want to risk a late payment or service cutoff. A personal US Mail check or money order may be delayed. Maybe they want to wait till the last moment during the “last chance” before penalty phase. It could be a language. Add to that the 11 percent of U.S. adults who don’t use the Internet, according to a Pew Research study, and it’s clear there will always there will always be a need to provide payment options to customers. That’s where a bill pay kiosk comes into play. The benefits of adding a bill pay kiosk to an organization’s payment options are many. For the customer, those include few service disruptions, improved credit and fewer reconnect and/or late payment fees. The kiosks in a way become the financial center or “bank” for the underserved, which they know the bank has ignored them. For the organization, they include more timely payments, fewer trips by a technician to reconnect service that was cut off, lower staffing needs at the payment center, fewer trips to payday loan, check cashing centers where they used to go before the kiosk, and overall much improved customer satisfaction. That translates to higher retention of existing customers and a higher acquisition rate of new customers. Still, accepting payments by kiosk isn’t just a matter of setting up a device in the headquarters lobby and hoping for the best. Here are a few considerations to take into account when deploying a bill pay kiosk. 27 percent of U.S. households do not have regular access to banks and other mainstream financial services. That’s 90.6 million financially marginalized people who are further penalized, in terms of time and money, by having to rely on alternate financial services (AFS), which charge fees for transactions that are often free to customers of banks, credit unions and other federally insured institutions. Despite the financial recovery since the Great Recession and the growth of online financial services, the number of households with little or no access to bank accounts has remained stubbornly steady since 2009, when the FDIC began collecting statistics on the phenomenon. Theresa Schmall, a manager at CFSI, points out that “solutions using digital and mobile platforms can provide expanded access” for the unbanked. It may also remove the presumption of exclusivity that prevents many unbanked and underbanked households from approaching mainstream financial services — while also eliminating those seemingly endless lines. By a large margin, those people who don’t use the Internet are 65 or older. Some of the main reasons, they say, are that it’s too difficult and they believe they’re too old to learn. If the kiosk application is too difficult to use it’ll be the same reason they give for avoiding it. 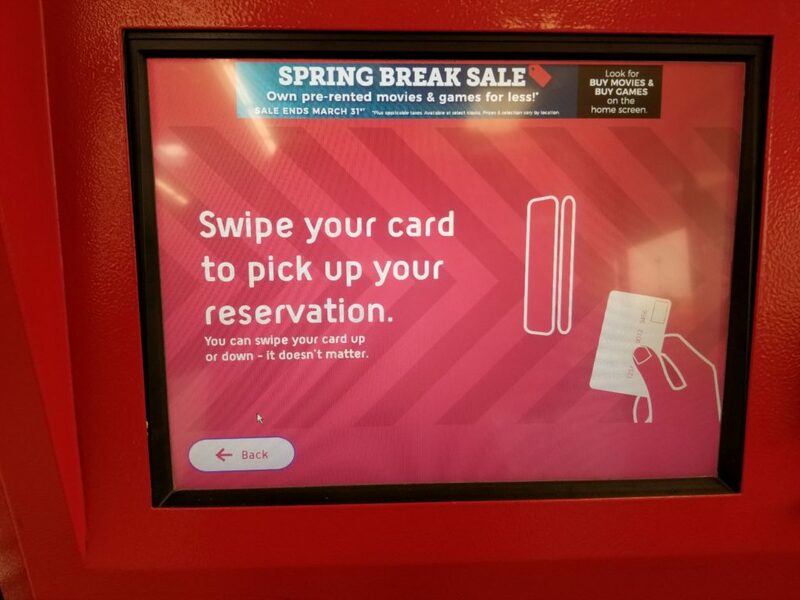 Incorporate large fonts and a logical payment process for the interface to make the kiosk easy on the eyes and the brain. Incorporate a simple way to start the process over if the user makes a mistake. It won’t hurt to have a staff member nearby during the first few weeks after initial rollout to assist first-time users. Kiosk technology also makes it easy to incorporate a variety of languages; make sure you include those options, especially if the unit will be located in a culturally diverse area. Users will appreciate it. Include marketing materials about the new bill pay kiosks with bills, in print ads, on TV commercials, and on your website. Also have office staff inform customers who come in to pay their bills about the devices, and offer to guide them through the payment process. One of the beauties of kiosk technology is that it allows organizations to expand their footprint without the capital costs of a brick-and-mortar location. In addition, we now live in a world where people expect to be able to conduct business at any hour of the day. One way to increase the value of bill pay kiosks is to place them in areas where customers can access them at any time of the day or night, in a place that’s convenient for them. Along with placing a kiosk in the lobby of the central office, consider placing units in grocery stores or other 24-hour locations. This would be especially important when a significant number of customers live in rural locations. Nothing will frustrate customers more than a kiosk that’s out of order when they need to pay a bill. If it happens more than once, you’ve likely lost them as kiosk customers forever. Invest in a solution that incorporates quality, reliable hardware. One the same note, make sure the kiosk hardware and software is secure from tampering. The last thing a business needs is the expense and negative publicity that accompanies a data breach. Partnering with an experienced vendor saves you the headaches of learning these lessons on your own. Work with someone that has existing projects and can offer consulting and advice on how to make your project a success. Olea Kiosks stands ready to help. To get started with a free consultation, call Olea Kiosks today or contact us online. TouchPay™ is the country’s only fully automated, real-time, stand-alone bill pay kiosk terminal that, in partnership with over hundreds of billers from utilities, telecommunications, ticketing, gaming, e-government, insurance and much more, offers the Filipino the ultimate convenience in bills management incorporating speed, safety, and security, 24 hours a day, 7 days a week. If you’re tired of getting in line at the bank or the mall for paying up your bills, TouchPay™ is the best solution to cut time and effort. All of the services you can think of are available at your fingertips: from electric bills, to internet, to flight tickets and booking, to remittance, to loading stations. 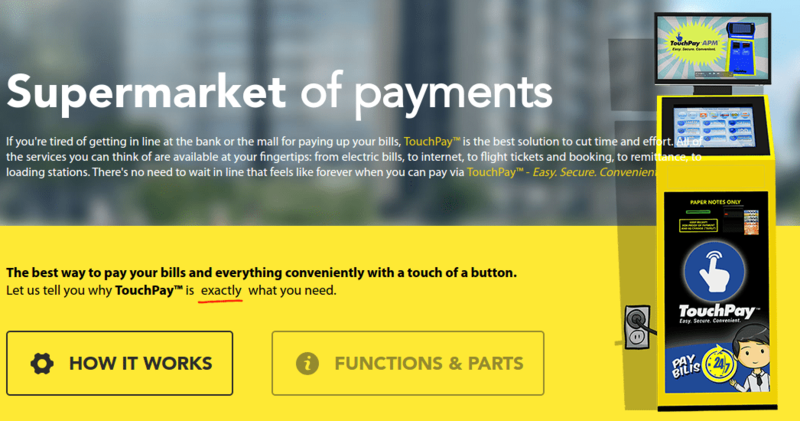 There’s no need to wait in line that feels like forever when you can pay via TouchPay™ – Easy. Secure. Convenient. The 30 kiosks placed at DTE payment centers and select Rite Aid pharmacies in locations around Detroit and Michigan accept all forms of payment, including cash. 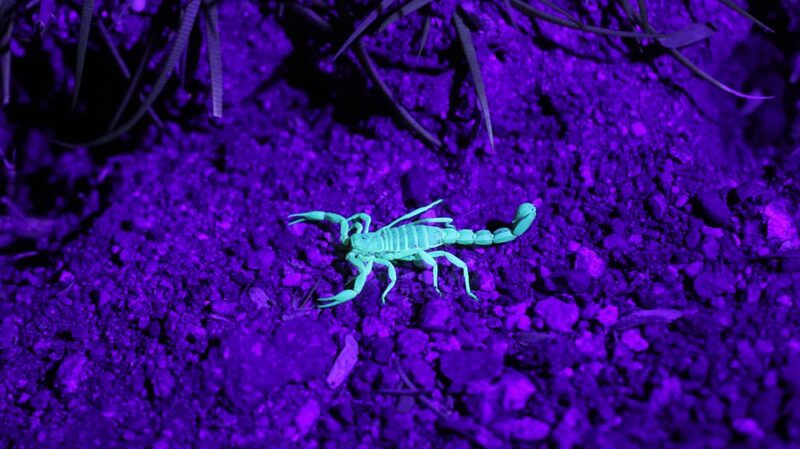 The targeted customer is someone who might not have a credit card or bank account. Early returns are strong, company executives say. Of the utility’s 200,000 walk-in payment transactions, 25,000 used a DivDat kiosk last month. The use of its kiosks grows between 10% and 15% month-over-month. More than 90% of customers who use the kiosk one time use it again. For Bierkle, the goal is broader than Michigan. He imagines a future of conveniently located kiosks where customers could pay a variety of bills, from water to electric to phone, in one spot without charge. Unlike a payment center, these kiosks would be located in retail stores like Rite Aids that are open on nights and weekends. A separate trial program inside several area churches also is under way, he said. The growing use of cash-collecting kiosks in Michigan comes as the Obama administration launched a new initiative last week to boost banking access for millions of Americans who don’t currently have checking or savings accounts. The recent financial lending crisis and recession have shined a light on the potential dangers for consumers who shell out higher rates and fees for access to last-ditch credit. Millions of Americans don’t have a sufficient enough financial history to receive a credit score, which can unlock traditional forms of lending, according to Lew. Bierkle says DTE customers already are using the blue-and-gray kiosk in a number of ways its creators did not necessarily anticipate. Some customers are prepaying their bills to ensure they don’t lose service if times get tight. Others pay a little at various times during the month. Ted Williams, 61, who lives on Detroit’s east side and works in inventory at Ford, said he uses the kiosks at DTE payment centers when the lines grow too long or at a Rite Aid near the city airport when he stops in to pick up a prescription. Caregivers including parents of children living away from home and adult children of elderly people are also using the system to pay bills remotely for others. There is also evidence, Bierkle said, that the millennial generation in some cases prefers cash, making the kiosk attractive beyond those who may be without a bank account or credit card. But there are hurdles left to clear to move the business beyond its early stages. “We have two challenges,” he said. 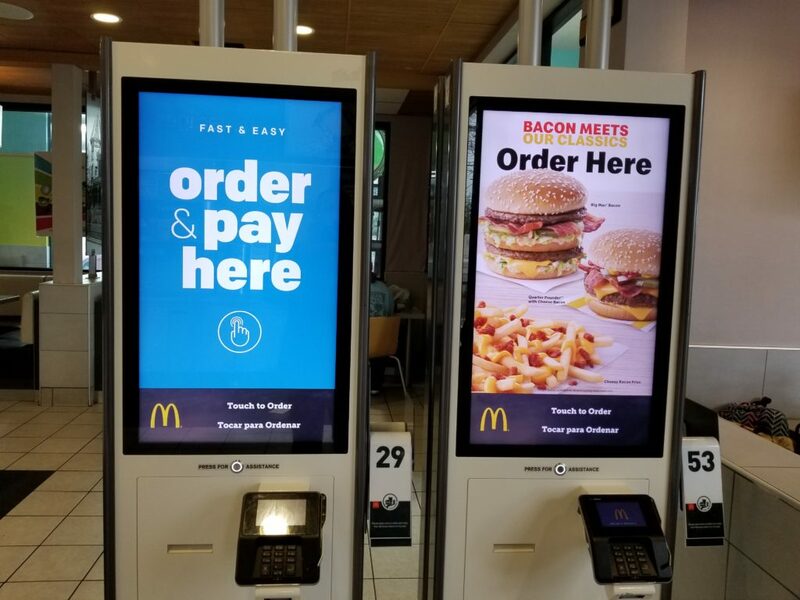 One is building awareness about the availability of the kiosks and another is reducing concerns that installing kiosks means putting customer-service employees out of work. For Bierkle, the kiosks are a natural evolution for his family’s business that started in early 1971 as a data processing company. Later, it developed a variety of bill-paying services for companies that progressed from the mail to faxes to the Internet. DTE sought a partner in 2012 for the kiosk idea and eventually found DivDat. DivDat charges DTE to operate the kiosk and the bill-paying company rents space from local Rite Aids in addition to kiosks stationed in DTE payment centers. “I consider it wildly successful,” Ronald Gillmore, kiosk program manager for DTE, said in an interview. The program collects about $3.5 million a month for the utility. “We’re probably going to look at expanding the network,” Gillmore said. DTE has 2.1 million electric customers and 1.2 million gas customers (and some overlap), the company said. It can still be a challenge to persuade some older customers to adapt to the new technology, Gillmore said. But once they do, most become repeat customers, he said. Starting this morning South Tipton County residents will be able to conduct county business in Atoka. Three months ago the Tipton County Legislature appropriated $12,800 for a kiosk in the lobby at Atoka City Hall and it will be unveiled at a ribbon cutting today at 10 a.m. Residents will be able to renew vehicle registration and pay court fines and county property taxes 24 hours a day at the kiosk. Editors Note: Thanks to Olea Kiosks for sending update to us here at Kiosk Industry. Olea provides bill pay services. If you are an affected customer that received a notice about the TIO security incident, and have any questions, you can still reach out to the Experian call center Monday to Friday 6:00 AM – 6:00 PM PT, and Saturday and Sunday 8:00 AM to 5:00 PM PT at (855) 272-6796 (toll-free) for domestic callers or (479) 788-5000 (toll) for international callers. If you are an affected customer that received the customer notice, and have any questions, you can reach the Experian call center Monday to Friday 6:00 AM – 6:00 PM PT, and Saturday and Sunday 8:00 AM to 5:00 PM PT at (855) 272-6796 (toll-free) for domestic callers or (479) 788-5000 (toll) for international callers. 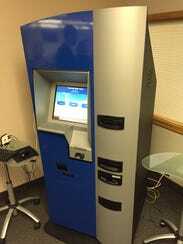 “There’s been a noticeable increase in kiosk usage since we implemented the cash option,” said MVD Director Eric Jorgensen in a statement. “Compared to a year ago at this time, the kiosk usage has increased more than 50 percent. Part of that is due to higher overall customer awareness of kiosks, but there’s been a definite uptick in usage since the cash kiosks were put in place. Cash kiosks handle all paper U.S. currency and are able to make exact change. The machines also accept personal checks. SAN JOSE, Calif. & VANCOUVER, BC – PayPal Holdings, Inc. (Nasdaq: PYPL) and TIO Networks Corp. (TSXV: TNC), a cloud-based multi-channel bill payment processing and receivables management company, today announced a definitive agreement under which PayPal will acquire TIO for $3.35 CAD ($2.56 USD) per share in cash or an approximate $304 million CAD ($233 million USD) equity value. The purchase price represents a premium of 25.2% to TIO’s 90-trading day volume-weighted average price as of February 13, 2017, and 22.6% to the 20-trading day volume-weighted average price as of January 9, 2017, the trading day immediately preceding the date TIO entered into exclusive negotiations with PayPal. TIO is a leading multi-channel bill payment processor in North America and processed more than $7 billion USD in consumer bill payments in fiscal 2016. TIO serves 14 million consumer bill pay accounts* and offers convenient solutions for expedited bill payment services to financially underserved consumers. The company has more than 10,000 supported billers and numerous direct relationships with billers, which enable TIO to quickly process telecom, wireless, cable and utility bill payments for TIO’s customers. Using TIO’s approximately 900 operated self-service kiosks, approximately 65,000 retail walk-in locations, and mobile and web solutions, customers can conveniently pay their bills while avoiding the service interruptions and financial penalties associated with missed payment deadlines. Aligned with PayPal’s Vision: TIO supports PayPal’s vision of democratizing money by giving consumers more convenient and affordable ways to pay their bills. Expands Market Opportunity: TIO accelerates PayPal’s entry into bill payments with 14 million consumer bill pay accounts*, approximately 60 million transactions processed in TIO’s fiscal 2016 and a processing network that includes more than 10,000 billers. Extends Consumer Value Proposition: PayPal’s intention is to offer TIO’s valuable service to PayPal’s customers within its online and mobile experiences. Upon closing of the acquisition, TIO will operate as a service within PayPal. PayPal intends to fund the transaction with cash on its balance sheet. There will be no change to PayPal’s previously communicated fiscal 2017 guidance and three-year outlook based on the acquisition of TIO. For the fiscal year ended July 31, 2016, TIO generated $74.7 million CAD in revenue ($57.1 million USD) and $10.6 million CAD in adjusted EBITDA ($8.1 million USD). TIO defines EBITDA as earnings before interest, tax, depreciation and amortization and adjusted EBITDA as EBITDA plus stockbased compensation, non-recurring transaction and restructuring expenses. The acquisition is expected to close in the second half of 2017, and will be completed by way of a plan of arrangement under the Business Corporations Act (British Columbia). The completion of the transaction will be subject to the approval of at least two-thirds of the votes cast at a special meeting of TIO shareholders and optionholders present in person or represented by proxy at the meeting, by: (i) TIO shareholders; (ii) by TIO shareholders and optionholders, voting together as a single class; and (iii) a majority of the votes cast by TIO shareholders present in person or represented by proxy at the meeting, excluding for this purpose votes attached to the TIO common shares held by persons described in items (a) through (d) of Section 8.1(2) of Multilateral Instrument 61-101 – Take-Over Bids and Special Transactions. The meeting of shareholders and optionholders is expected to take place in April, 2017. In addition to TIO securityholder approvals, the transaction is also subject to other closing conditions, including the receipt of approvals relating to TIO’s money transmitter licenses, the expiration or early termination of the applicable pre-merger waiting period under the Hart-Scott-Rodino Antitrust Improvements Act of 1976, and court approval in British Columbia, Canada. The transaction has been approved by the boards of directors of each of TIO and PayPal, and the TIO Board recommends that TIO shareholders and optionholders vote in favor of the Arrangement. The recommendation of the TIO Board was based on the recommendation of a special committee of independent directors of TIO. The financial advisor to TIO, Raymond James Ltd., has provided a fairness opinion to the special committee and board of directors of TIO that, subject to the assumptions, limitations and qualifications set out in such fairness opinion, the consideration to be received by TIO shareholders pursuant to the plan of arrangement is fair, from a financial point of view, to the TIO shareholders. In addition, TIO shareholders, directors and officers, including funds managed by Core Innovation Capital, Napier Park Financial Partners, Edison Partners, Inter-Atlantic Advisors and Inductive Capital, representing approximately 50.4% of the issued and outstanding common shares have agreed to vote their shares in favor of the transaction. The transaction includes customary deal protection provisions, including non-solicitation of an alternative transaction and a termination fee payable to PayPal under certain circumstances. Further information regarding the transaction will be contained in the management information circular which is expected to be mailed to TIO shareholders in March in connection with the special meeting of TIO shareholders to be held to consider the transaction. Copies of the definitive agreement and the management information circular will also be available under TIO’s SEDAR profile at www.sedar.com. In addition, free copies of the documents may be obtained from TIO’s investor relations website at http://corporate.tionetworks.com/ or by contacting TIO investor relations at [email protected] All TIO shareholders are urged to read the management information circular as it will contain additional important information concerning the transaction. Perella Weinberg Partners LP is acting as financial adviser to PayPal, and Sidley Austin LLP and Blake, Cassells & Graydon LLP are acting as legal advisers on the transaction. Raymond James Ltd. is acting as financial adviser to TIO, and Davies Ward Phillips & Vineberg LLP, and Fasken Martineau DuMoulin LLP and Morrison & Foerster LLP, are acting as legal advisers for the TIO Special Committee and TIO, respectively. * Consumer bill pay accounts represent the total number of accounts between consumers and billers. A consumer may have a relationship with more than one biller and may have more than one account. ** Source: World Bank Global Findex 2014. Fueled by a fundamental belief that having access to financial services creates opportunity, PayPal (Nasdaq: PYPL) is committed to democratizing financial services and empowering people and businesses to join and thrive in the global economy. Our open digital payments platform gives PayPal’s nearly 200 million active account holders the confidence to connect and transact in new and powerful ways, whether they are online, on a mobile device, in an app, or in person. Through a combination of technological innovation and strategic partnerships, PayPal creates better ways to manage and move money, and offers choice and flexibility when sending payments, paying or getting paid. Available in more than 200 markets around the world, the PayPal platform, including Braintree, Venmo and Xoom, enables consumers and merchants to receive money in more than 100 currencies, withdraw funds in 56 currencies and hold balances in their PayPal accounts in 25 currencies. For more information on PayPal, visit https://www.paypal.com/about. For PYPL financial information, visit https://investor.PayPal-corp.com. Visit www.tionetworks.com or join the conversation on Twitter and Facebook. LOUISVILLE, Colo.–(BUSINESS WIRE)–KIOSK Information Systems (KIOSK) is announcing a new bill pay software platform at the NRF Big Show, 2017, Booth #3805. The modular application provides a complete user flow for payment of multiple bills (via cash, card, and check) and common account inquiries. While unique customer features or additional flow paths can be readily integrated by KIOSK’s Application Development team, the base product license accomplishes the most common transaction functionality KIOSK has encountered with other major retail bill payment and money services clients. Editor Note: The acquisition of KIOSK by Posiflex is official. In a blockbuster deal Posiflex is expanding from its historical POS transactional market into the self-service kiosk market in a huge way. With a Posiflex market cap of over $11 Billion, KIOSK becomes part of a company over twice the size of NCR, the other major kiosk player. From our vantage point this acquisition will provide all types of advantages to KIOSK and help it grow market share faster. KIOSK had been purchased by Alerion Capital three years and their principal aim seemed to be to accelerate the profit and then turn the company after three years. I expect Posiflex will make some very positive investments which should allow KIOSK to truly become the dominant state-of-the-art manufacturer. We spoke with Weaver and yes he is staying (and we expect the COO Dan Houck will stay as well). Well played! NEW TAIPEI CITY, Taiwan–(BUSINESS WIRE)–Taiwanese Point-of-Sales terminal brand leader Posiflexannounced today that they have entered into a purchase agreement with KIOSK Information Systems (KIOSK), a world leader in self-service solutions. Posiflex will offer KIOSK a cash purchase for all outstanding ordinary shares, for a total consideration of approximately $US 105 million. Both companies are industry forerunners known for best-in-class POS and self-service platforms. Combining these complementary strengths positions Posiflex for continued growth tied to emerging “Internet of Things” (IoT) applications within the service automation industry. Retailers, financial service providers, hospitality and logistics service providers are key among an even wider industry audience driving steady and steep demand in transaction automation. Deployers are increasingly incorporating self-service as a “must-have” element of today’s Omnichannel consumer experience; increasing touch points, reducing costs – all while simultaneously collecting valuable transaction data. KIOSK is unique among its’ competitors in its ability to provide a complete end-to-end solution encompassing custom design engineering, manufacturing, software development, field services, and highly secure managed services. This “total solution” approach to services has fueled KIOSK’s continued growth and reinforced analyst’s rankings of KIOSK as the dominant North American provider and #3 globally. Post-transaction plans are to retain and empower the current KIOSK Management Team with no operational or organizational restructuring required as result of the transaction. 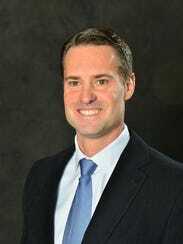 Tom Weaver, KIOSK’s current CEO, will now hold dual Board of Director roles for both Posiflex and KIOSK. This will accelerate efforts of the current management team to execute KIOSK’s strategic growth plans, leveraging key Posiflex resources. Access to a global sales network and highly relevant engineering / integration capabilities are among many strategic leverage points created by combining the companies. Leveraging Posiflex’s international channel reach throughout Greater China, Asian Countries, Russia, India, and Europe; KIOSK is uniquely positioned to ensure sustainable market growth not only in North America, but also the global marketplace. Further, Posiflex will provide substantial advantage for KIOSK tied to upgrading critical components and peripheral modules. This ultimately enhances KIOSK’s future solution offerings with even more advanced product and service coverage capabilities. This transaction was advised by KPMG Corporate Finance LLC, and is expected to close in 2016-Q3. Founded in 1984, Posiflex Technology, Inc. has designed and manufactured its own-branded and world-class POS solutions. Recognized as a pioneer and leader in the industry, Posiflex has been awarded more than 30 patents for innovative design. The company’s products are manufactured in two ISO 9001/9002/14001 facilities in Taiwan and sold worldwide through retail, hospitality, banking, healthcare, kiosks and many other verticals. Posiflex’s offices are in the USA, Germany, China, India, Singapore, Malaysia, Japan, Dubai and Argentina along with the global distribution networks to provide direct and timely support to its customers around the world. For more information: www.posiflex.com. As the Market Leader in Self-service Solutions, KIOSK provides proven expertise in design engineering; application development, integration, manufacturing, field support, and managed services for even the most sophisticated self-service platforms. 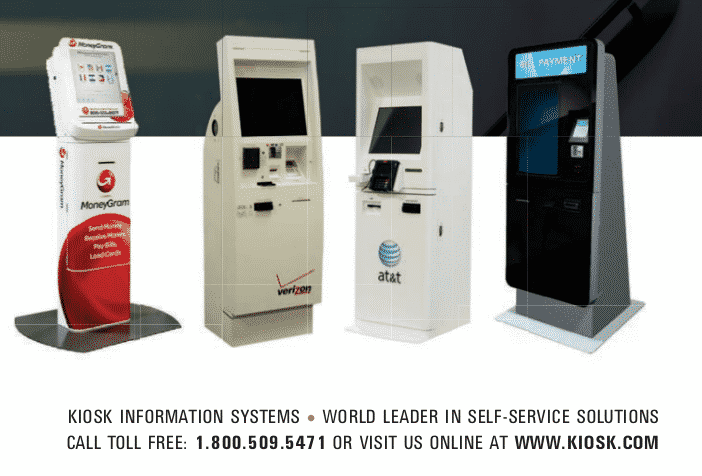 An exceptionally broad portfolio of standard and custom KIOSK designs are deployed among Top 100 Retailers and Fortune 500 clients in virtually all self-service vertical markets.www.kiosk.com, 800.509.5471. TAIPEI — Posiflex Technology Inc. (振樺電子), a Taiwan-based Point-of-Sales terminal brand, has agreed to acquire KIOSK Information Systems in the United States, the largest self-services solution provider in North America. Under the acquisition agreement, Posiflex will spend US$105 million to acquire KIOSK, marking the largest acquisition deal in the industrial computer sector in Taiwan. Posiflex’s board of directors has approved the acquisition. Market analysts said that the deal showed Posiflex’s ambitions to expand by swallowing a large company like KIOSK; the consideration of the deal is almost five times the Taiwanese suitor’s paid-in capital. According to the Taiwan Stock Exchange, Posiflex is capitalized at NT$676 million (US$21.6 million), and had started procedures for listing on the local main board since November 2012. Before the main board’s listing, Posiflex had been listed on the over-the-counter market since July 2005. Commenting on the acquisition deal, Posiflex said that KIOSK ranks as the third largest self-services solution provider in the world. The U.S. firm’s clients come from a wide range of industries globally, like telecom services, retail, logistics and financial services, Posiflex said. Among the prominent clients of KIOSK are AT&T, IKEA, PepsiCo., McDonald’s and U.S. Postal Services, Posiflex added. The suitor said that the acquisition agreement was reached because KOISK’s major shareholder, a private equity fund, was planning to dispose of the U.S. firm for profit. Through the acquisition, Posiflex said that it expects to enter the self-services business by taking advantage of the suitor’s existing lead in the Point of Sales terminal technology. In the past three years, KIOSK posted more than 30 percent in compound annual growth rate (CAGR) with its gross margin ranging between 35 percent and 40 percent, Posiflex said. In the first seven months of this year, KIOSK’s earnings before interest, taxes, depreciation and amortization topped US$7 million, Posiflex added. Analysts said that after the acquisition, Posiflex is expected to see its revenue for next year double from this year. In the first seven months of this year, Posiflex posted NT$1.78 billion in consolidated sales, up 6.18 percent from a year earlier. “By combining Posiflex and KIOSK’s dual-value proposition in this domain, we are confident in emerging as a distant leader in this growing market,” Posiflex Chief Executive Officer Owen Chen said in a statement. Posiflex said that it will assign its own funds to pay for 20 percent of the total consideration in the deal, while it will be seeking bank loans to pay for the remaining amount. The company said that it could issue new shares and convertible bonds to repay its bank loans in the future. After the acquisition is completed, Tom Weaver, KIOSK’s current CEO, will hold dual board of director roles for both Posiflex and KIOSK. 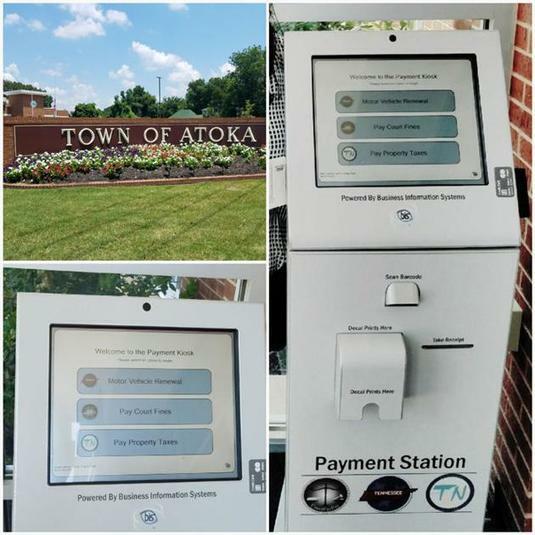 Self-service bill pay kiosks throughout the county are now accepting county real estate tax payments. When General Payment Systems, Inc. (GPSI) made the move into courthouse payment systems, they needed a compact solution that focused on a number of criteria including efficiency and reliability. 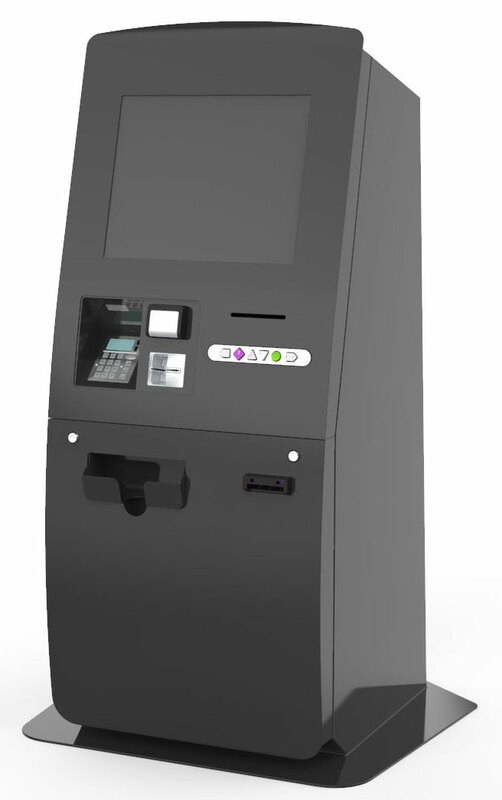 2ft x 2ft x 6ft kiosk which accepts check, money order, credit and debit card payments, and most importantly, accepts and pays change in cash. The MEI BNR is also suited for semi-protected outdoor environments – which is ideal for court-houses where indoor space is at premium and lobby hours are limited. The MEI BNR delivers significant ROI thanks to: reductions in float, shrinkage and labor; improved machine uptime; cashback functionality, and enhanced security. are able to carry out the workload of two other units. The speed and efficiency of the kiosk reduces queuing and results in end-user-satisfaction. received from Crane Payment Innovations. MEI BNRs, feedback has been 100% positive and any minor problems were resolved quickly and easily,” said Mr Trujillo. “Customers benefit from the reduced time to take the payment. MoneyGram (NASDAQ: MGI) has won two prestigious gold awards recognizing the company’s commitment to innovation at the 2016 PYMNTS Innovator Awards ceremony. The company won “Best Cash Innovation” for revolutionary kiosk solutions and also “Best Comeback Story” for MoneyGram.com‘s new state-of-the-art online platform. repeat user experience, multiple languages, and minimal data entry for the customer. MoneyGram’s kiosks can be found inside more than 2,200 CVS locations in the U.S. as well as inside stores and post offices in Europe. MEBANE, N.C., Jan. 12, 2016 /PRNewswire-iReach/ — ARCA, a global leader in the development of cash automation technology for banks, retail locations and self-service kiosks, today announced that it will demonstrate a three-level cash management approach at the NRF’s Annual Convention & EXPO, the United State’s premiere event for retail innovation, to be held January 17 – 20, in New York City. NRF’s Big Show 2016 focuses on the latest retail technology and trends. Cash handling has been identified as one of the major problems for retailers all around the world. ARCA’s retail product range features a wide selection of hardware and software that adapts to various store formats and different retail needs. A till-side cash deposit system is available for immediately securing high-value notes at checkout. Mid-size smart safes allow retailers already benefiting from CIT pickups to obtain cash automation efficiency without changing their whole process. Combined cash deposit/recycling solutions are convenient for operational cost reductions and cash management efficiency with an integrated cash recycling function that improves till float efficiency. More than 670,000 people have obtained the identification cards since the program began in January. One of the program’s goals is to help many of those people obtain bank accounts. But some of the biggest banks in the city — including JPMorgan Chase,Bank of America and Citigroup — will not accept the cards as a primary source of identification, even though their federal regulators and some smaller banks have approved their use. Good article on unbanked in New York, Thanks Kirk at ARCA! Ovum recently conducted a global survey of 300 retail banking executives to ask about their greatest branch challenges today, and where they believed the challenge might shift in the next few years. Maryland drivers who have unpaid traffic citation fines have a new way to pay it off. The number of kiosks has grown from five to 25, located at DTE payment centers and neighborhood Rite Aid drug stores, primarily in Detroit. Many of the drug stores are open 24 hours a day, seven days a week for added customer convenience. DTE selected a Michigan-based company, DivDat, to help develop the kiosk technology. In 2014, DTE spent $922 million with Michigan-based suppliers of products and services. excellent writeup on cash dispensing, cash recycling. cash is 50% of transactions. Read the entire article on bbc.com — It’s tempting to forecast the demise of cash. In fact, people have been predicting the end for physical money for nearly 60 years. With the rise of credit cards, contactless payments and cryptocurrencies like Bitcoin the death knells have only gotten louder. The Netherlands is an interesting case study to look at more closely, because their retail sector has recently embraced card payments in a big way. There are now 1,400 supermarkets in the Netherlands with registers that don’t accept cash. Studies of other nations tie in with these findings. The Cameron County Clerk’s office has installed self-service kiosks in Brownsville and San Benito . The kiosks, which offer instruction in both English and Spanish, allow county residents to pay misdemeanor court fines quickly, easily and conveniently, officials said. Announcing newest Bill Pay Kiosk Outdoor thru wall JACK in a small city market. The city of Winnsboro has a population of around 3400 & about 1000 water accounts. Winnsboro JACK went live Sunday, July 19th, & during only the first three days of operation JACK completed over 60 successful transactions (payment times range from 3AM to 10PM) and collected over $6200. Winnsboro JACK is ON THE JOB and working 24×7 to provide payment convenience for all the citizens. In Winnsboro you may contact City Manager Jeff Howell or City Secretary Shelly Griffin for more information. Press release issued by ARCA today. The addition of the cash recycler is big news plus the new Android support. At some point ARCA will abstract these devices into network appliances, and cash is still 50% and holding steady (and growing some). Mebane, NC (July 9, 2015) — ARCA, a global leader in cash and payment automation technology, announced today that its self-service software development platform, Envoy™, is now compatible with Crane Payment Innovation’s (CPI) all-new MEI SCR bill recycler and SC Advance series bill acceptors. Envoy™ accelerates the integration of self-service transaction software with kiosk hardware by bridging the gap between software development and hardware integration. By integrating Envoy™ with two of CPI’s most popular components, ARCA is demonstrating its commitment to helping developers and engineers integrate components seamlessly. The MEI SCR is a two-denomination cash recycler component engineered to reduce costs associated with cash management. When equipped with the bunch-note feeder (BNF) and a larger cash box, the SCR can alternatively be employed as an entry-level deposit device with multi-note escrow capabilities. The SC Advance series of bill acceptors are designed with enhanced bill recognition technology with multiple configurations allowing it to be tailored to many different environments. Multi-vendor support – not just one brand, one product. Envoy is available for purchase immediately and is downloadable from the ARCA Developer Portal (developer.arca.com) after registering. Since 1998, ARCA has been helping people find better ways to automate financial transactions in bank branches, retail stores and self-service kiosks. Today, with customers in over 50 countries, ARCA continues to grow by providing technology and services to make transactions simpler, more efficient and more secure. To learn more about ARCA’s innovative culture and commitment to our customers, please visit www.arca.com. heritage of such brands as CashCode, Conlux, MEI, Money Controls, NRI and Telequip and holds one of the world’s largest installed base of unattended payment systems. CPI payment systems are recognized for delivering the greatest positive impact on operator profitability and consumer satisfaction in a variety of industries, including the bill payment kiosks. From banknote acceptors and recyclers to a wide range of coin products, CPI devices are mission critical to the operation of self-service machines. ARCA is definitely one of the leaders in financial technology. The Alliance with HP only increases their spread. Another smart move by a smart company. We provide technology and services to help people control cash in bank branches, retail stores and self-service kiosks. Since the company began in 1998, ARCA has experienced strong, consistent growth and now has operations in the United States, the United Kingdom, Italy, Russia, India and China. More companies are seeking new and better ways to serve customers with transaction automation solutions. ARCA’s vision and commitment to customer service and technological innovation has helped companies become industry leaders. Today, ARCA provides the largest selection of cash handling devices of any manufacturer in the world. We provide cash automation technologies to customers in over 50 countries and support these devices with world-class service from our headquarters near the Research Triangle in North Carolina.